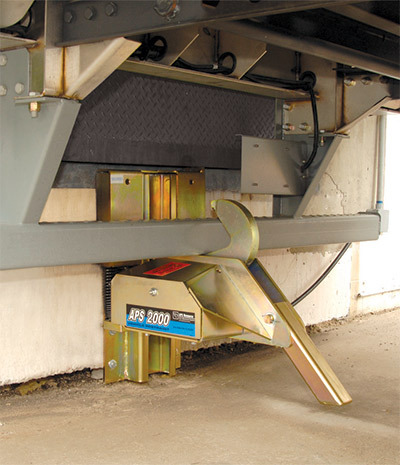 Vehicle restraints are a key part of an integrated loading dock safety system. Used as a stand alone safety product or in conjunction with combination control panels, truck restraints lock trailers into position at the loading dock. A system of lights on the outside of the loading dock tells the driver when the vehicle is safely locked in or released. 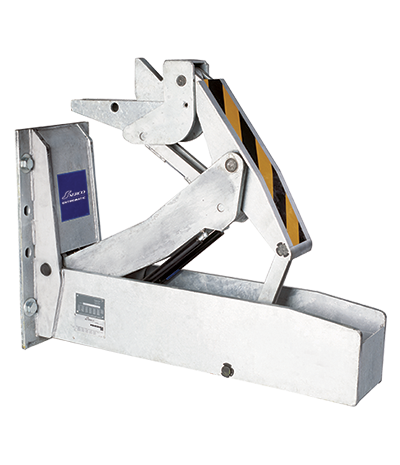 The manually operated Serco SL10 vehicle restraint is a base model offering excellent performance and value at an economical price, designed to engage the rear impact guard of a vehicle and hold the vehicle at the loading dock during the loading and unloading process. The SL10 includes a control bar to activate and release the unit, so no lifting is required. 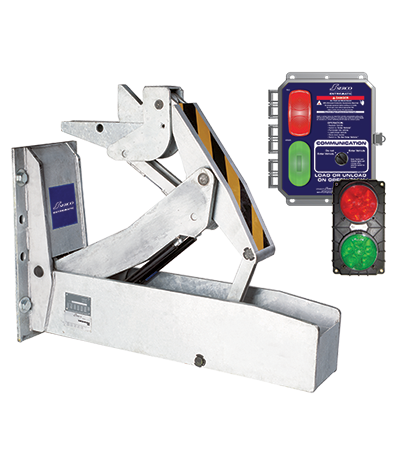 The manually operated Serco SL20 vehicle restraint system offers the same excellent performance and value as the SL10, but also includes manually activated interior and exterior red/green LED lights for improved communication. 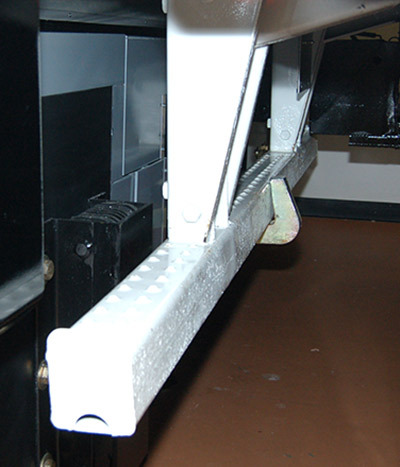 The control bar allows dock workers to easily engage and release the restraint from warehouse floor. The Serco SL40 is a manually operated vehicle restraint system like the SL20, but the SL40 automatically senses the actual contact between the restraint and the vehicle’s rear impact guard and communicates its status via interior and exterior red/green LED lights. The control bar allows for easy manual activation and release. The SL40 provides exceptional value and a low cost of ownership. 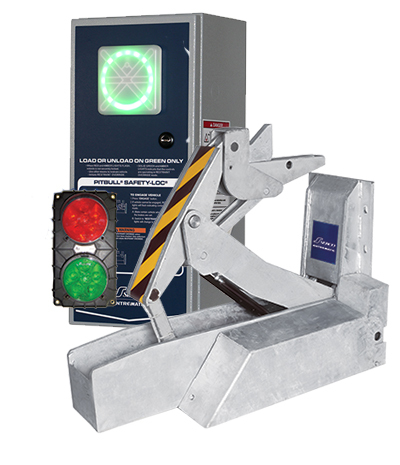 Serco SL60 Series vehicle restraints provide automatic push-button activation with advanced electronics and standard LED communication systems for increased dock safety and security. Driveway or wall-mounted, SL Series powered restraints engage the rear impact guard of a vehicle and hold it in place during the loading and unloading process. The restraint is raised and lowered automatically at the touch of a button, and the exclusive sensor bar automatically senses and communicates the contact between the restraint and the trailer’s rear impact guard. The programmable logic controller (PLC) offers more flexibility to meet the evolving needs of your facility. The SL60 will auto-reverse if no rear impact guard contact is made, signaling dock workers via the LED lights to ensure maximum operational safety. ** NEW IN 2018** Serco SL60 Series vehicle restraints are now available with our new, slimmer, single-LED readout control panel. SL70 Powered Vehicle Restraint – Same features and operational benefits of the SL60, but also includes a trailer presence sensor. SL80 Powered Vehicle Restraint – Same features and operational benefits of the SL60, but with the addition of a trailer presence sensor and automatic engagement of the trailer RIG. SL90 Powered Vehicle Restraint – Same features and operational benefits of the SL60, but with the addition of a digital monitor and multi-code keypad lockout override to prevent unauthorized use. Ideal for new construction and remodeling applications, the Serco SLP3000 recessed vehicle restraint is hydraulically activated to effectively control vehicle movement by grabbing and holding the rear impact guard throughout the loading and unloading process. It’s easily installed in a pit under the dock leveler, allowing for a clean dock face when the restraint is retracted. This design also makes it possible to have unobstructed access to smaller delivery vehicles, trailers with hydraulic lift gates and an open drive for unimpeded snow plowing or drive cleanup. It also includes advanced safe engagement signaling and an interlock-capable control panel. The APS2000® is a superior version of the traditional impact-style vehicle restraint that combines an advanced communication system with a low-profile carriage and a patented IP67S-rated motor. It also has an impact extension bar that accommodates a wide range of lower rear impact guards. ** NEW IN 2018** APS2000 vehicle restraints are now available with our new, slimmer, single-LED readout control panel.